Interaction between hair cells and acellular gels of the mammalian inner ear, the tectorial and otoconial membranes, is crucial for mechanoreception. Recently, otoancorin was suggested to be a mediator of gel attachment to nonsensory cells, but the molecular components of the interface between gels and sensory cells remain to be identified. We report that the inner ear protein stereocilin is related in sequence to otoancorin and, based on its localisation and predicted GPI-anchoring, may mediate attachment of the tectorial and otoconial membranes to sensory hair bundles. It is expected that antibodies directed against stereocilin would specifically label sites of contact between sensory hair cells and tectorial/otoconial membranes of the inner ear. Our findings support a unified molecular mechanism for mechanotransduction, with stereocilin and otoancorin defining a new protein family responsible for the attachment of acellular gels to both sensory and nonsensory cells of the inner ear. The cochlea and the vestibule, respectively, are responsible for hearing and balance in the mammalian inner ear. The tectorial membrane, an acellular gel, covers the surface of the organ of Corti within the cochlea. Similarly, otoconial and cupula membranes overlie sensory regions of the five organs constituting the vestibule. Sound-induced motion of the basilar membrane in the cochlea or head motion in the vestibule generates shear between the acellular gels and the apical surface of the sensory epithelia; the latter consist of both hair (sensory) and supporting (nonsensory) cells. Deflection of stereocilia bundles on sensory hair cells causes membrane potential alterations that transduce mechanical information into electrical signals [1–3]. Mutations in genes encoding protein components of the acellular gels result in hearing and balance defects, highlighting the importance of these structures in mechanotransduction [2–10]. Therefore, there is considerable interest in identifying molecules that are responsible for attachment of the gels to the sensory epithelia. Recently, two new genes specifically expressed in the human inner ear were described. 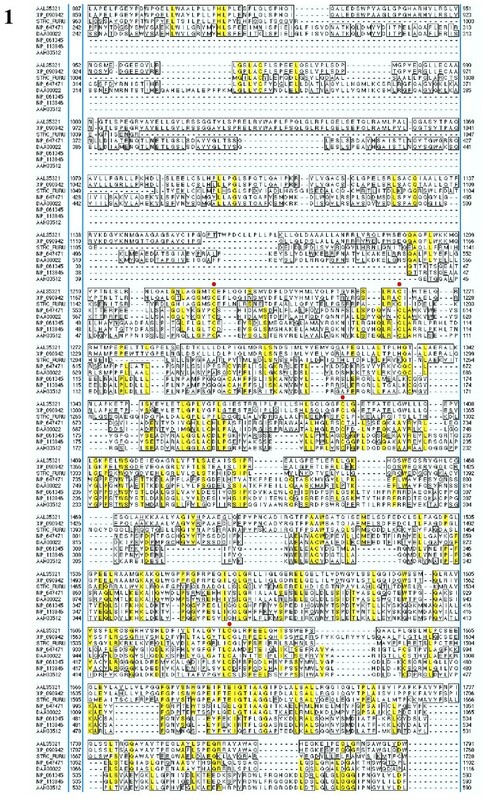 STRC, a chromosome 15q15 gene mutated in families affected by non-syndromic deafness at the DFNB16 locus, was predicted to encode a polypeptide of 1778 amino acids of unknown function and with no homology to other proteins . Mutations in the OTOA gene (chromosome 16p12.2) at locus DFNB22 also cause autosomal recessive deafness. Immunofluorescence studies in mouse suggested that the OTOA gene product, otoancorin (1153 amino acids), mediates contact between the apical surface of nonsensory cells and acellular gels of the inner ear, the tectorial and otoconial membranes . Otoancorin was found to share weak sequence similarity with megakaryocite potentiating factor/mesothelin, a GPI-linked glycoprotein of unknown function [13, 14]. Nevertheless, no similarity was reported between otoancorin and other known inner ear proteins. We performed PSI-BLAST  searches of the NCBI non-redundant database (~1,035,000 sequences) with conservative parameters (low complexity filter, expectation value 1, word size 2, inclusion threshold 0.0005) and found highly significant similarity between ~900 C-terminal amino acids of stereocilin and otoancorin (E-values at iterations 1 and 4 3e-14 and e-159, respectively; Fig. 1). Furthermore, analysis with DGPI, a server for automatic detection of GPI-anchored proteins , suggested that stereocilin, like otoancorin, is a secreted GPI-anchored protein. Multiple sequence alignment of stereocilin, otoancorin and mesothelin. Regions of homology are boxed, residues identical in more than 60% of the sequences are shaded in yellow and 4 cysteine residues conserved in all sequences are indicated by red dots. AAL35321, mouse stereocilin (1809 aa); XP_090942, human stereocilin (1778 aa); STRC_FURU, Fugu rubripes stereocilin (see below); NP_647471, mouse otoancorin (1137 aa); DAA00022, human otoancorin (1153 aa); NP_061345, mouse mesothelin (625 aa); NP_113846, rat mesothelin (625 aa); AAH03512, human mesothelin (621 aa). A gene encoding the putative Fugu fish homologue of stereocilin was identified by a BLAST  search of Fugu assembly release 2 (17.05.02)  with mouse stereocilin, matching sequences within scaffold 1525 (E-value 8.2e-58). GENSCAN  analysis of the genomic DNA was combined to local sequence alignments to known stereocilin sequences to yield a putative Fugu stereocilin homologue of 1994 amino acids, including an N-terminal signal peptide sequence and a predicted C-terminal GPI-anchor attachment site. STRC mutations resulting in truncation of stereocilin at amino acid positions preceding the start of the alignment with mesothelin were identified in human families affected by non-syndromal sensorineural deafness linked to locus DFNB16 . Acellular gels of the mammalian inner ear are attached not only to nonsensory cells, but also to hair bundles of sensory hair cells, composed of actin-rich stiff microvilli called stereocilia; the latter interaction is essential for mechanotransduction . Since otoancorin is not localised on hair bundles, it was hypothesised that a different system, possibly integrins, is responsible for their interaction with acellular matrices . In view of the fact that localisation of stereocilin in the inner ear is limited to sensory hair cells and, in particular, to the hair bundle , our findings strongly suggest that stereocilin may have a comparable function to otoancorin at the level of hair cells. Our hypothesis could be tested by carrying out microscopic examination of mouse inner ear hair cell sections immunolabeled with antibodies directed against stereocilin; one would expect to observe labeling at sites of direct contact between the hair bundles of sensory hair cells and the acellular gels. In addition, GPI-anchoring of stereocilin could be confirmed by transfecting mammalian cells with the corresponding cDNA and comparing the localisation of stereocilin on the membrane of transfected cells in the absence and presence of PI-PLC. Our PSI-BLAST results suggest that, in contrast to what was previously thought, similar molecular interactions may be responsible for mediating attachment of acellular gels to the different cell types of the inner ear. Since these connections are important for mechanotransduction of sound, it is not surprising that both STRC and OTOA mutations lead to deafness in humans. In this context, it is of interest to note that reported STRC mutations  result in deletions affecting the conserved protein region shown in Fig. 1. LJ is supported by a Human Frontier Science Program long-term fellowship. This research was supported in part by the NIH (LJ and PMW; grant HD35105). LJ recognised the sequence similarity between stereocilin and otoancorin. JP assisted the bioinformatic searches and methods. PMW assisted in coordinating this study, preparing the manuscript and maintaining a level of sanity.